As a special education teacher in an elementary school, Jessica Zanton witnessed firsthand how detrimental discriminatory language such as the word "retard" can be. To combat this, she and her students handed out stickers and buttons last year to the staff at her school as part of the first "Spread the Word to End the Word" event. "Regardless of whether the speaker uses it to hurt feelings, uses it casually or even jokingly, using the r-word perpetuates painful and dehumanizing stereotypes," Zanton said. This year, Zanton, now a graduate student in the College of Education at the University of Illinois, will participate in the second annual "Spread the Word to End the Word" day of awareness on Wednesday March 3, 2010. 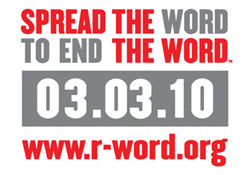 "Spread the Word to End the Word" is part of an ongoing effort between Special Olympics and Best Buddies International to work with schools to raise consciousness about the negative effects of the word "retard(ed)." Locally, groups such as the Champaign County Down Syndrome Network, Champaign-Urbana Autism Network, the U of I's professional teaching organization Epsilon Delta, the Special Education Graduate Student Organization, and the Junior League of Champaign Urbana have come together to promote awareness of people with disabilities and how derogatory language, such as the r-word, can be offensive. Students of Johnell Bentz, clinical assistant professor in the Department of Special Education, have volunteered to man booths at the College of Education, the Illini Union, the Activities and Recreation Center (ARC), and Peabody and Illinois Street residence halls, as well as local Champaign-Urbana area schools to promote awareness of people with disabilities. Part of their efforts will be to encourage people to visit www.r-word.org and take an online pledge that they will not use the r-word or other derogatory language. The site is updated in real time as participants around the country make the pledge. Students at the College of Education can make the pledge at a booth in the lobby March 3 from 10:30 - 2:30 p.m.
"I hope people will become more aware of issues surrounding the use of such derogatory words, and make a sincere commitment to be respectful of all people, regardless of ability," Zanton said. "Making the pledge is a quick and easy way to show support for individuals who have disabilities."